New: Create a new help project based on the default project settings. The drop-down menu item “Save as default settings” saves the default project settings. Blank: Create a new empty help project. CHM Classic: This is a preinstalled project template. 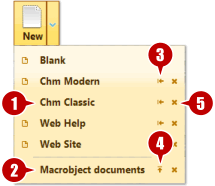 Create a new help project for Classic CHM help files. CHM Modern: This is a preinstalled project template. Create a new help project for Modern/Unicode CHM help files. Web Help: This is a preinstalled project template. Create a new help project for Web Help/Web documents. Web Site: This is a preinstalled project template. Create a new help project for Websites.